Joystick Select next menu item, game mode or difficulty, move the selector around in the game mode. Buttons A,B,X,Y Proceed with the selected menu item, game mode or difficulty. Rotate a piece or slide a piece when being pressed on the arrows. R + Joystick Move the screen in tv out mode around while being at the titlescreen or intro scenes to coop with overscan issues. Rotating: U need to complete the waternet by only rotating indivual tubes. 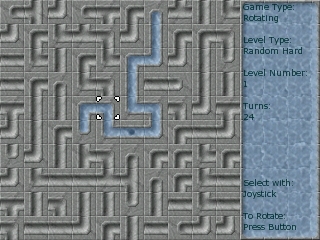 Sliding+Rotating: Combines the 2 previous game modes in one game so u need to slide and rotate to complete the waternet. U first see the intro and are then presented with the titlescreen where you can select the option u want. 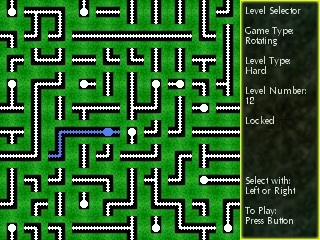 After selecting "play" u get to choose the game type and the level type. You are then presented with the level selector. If u had chosen a static level (easy,medium,hard,tutorial) u can view all the other levels by pressing left and right. If u had chosen a random level a new level will be generated by pressing left or right. Just press a button to play the level. The waternet.gpe file is actually a script that just launches the game's executable being "waternet". So if u are using Gmenu2x or another launcher create a link to the "waternet" file and use the wrapper from gmenu2x to restart gmenu2x instead of the default menu. For creating skins just change the graphic files to your liking (it doesn't have to be all of them but it's possible,you can for example change just the tubes.png and tubesconnected.png file) and place it in a folder named after your skin in the skins folder. You can also create a (linux) text file named color.txt in the skins directory and change the rgb values for the text color. Just look at the included samples. If you have created some skins feel free to tell me about it on my forums or on the gp2x forums, i'll gladly host them on my webserver ! 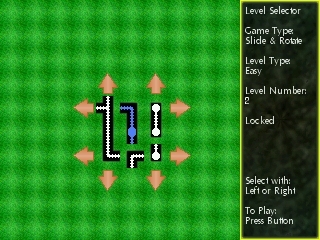 A level editor is included to create custom levels. You need to name the levels Level1.lev, Level2.lev, .... and place them in the "custom" directory, in the levels directory of the game type u created the level for. for example ./levels/sliding/custom/ if u created a custom level for the Sliding game type. Read the notes the first time you start the level editor and you are good to go. You control the level editor with the mouse, u click on a tile to select it and then u click on the spot where the tile needs to come and thats it. Waternet is created by willems davy Willems Soft 2007. Default skin graphics are made by me! http://www.midisite.co.uk/midi_search/ and was named techrap1 & techrap2 by unknown composer. 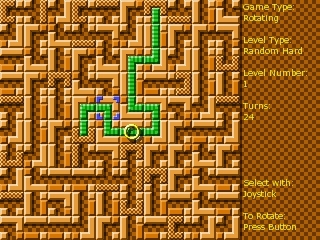 A Big thanks goes out to nagelfar for pointing out how i could generate levels programaticly, i didn't know the solutions were just a maze. Another thanks goes out to [M]att, Aniruddha and LeoS for testing out the game. Another BIG BIG THANKS goes out to Fusion_Power who had some great idea's on how to improve the game,and kept me motived on changing the stuff he requested. He also made some great looking skins which are included in the game. So if your playing the game with one of his skins, be sure to thank him as well ! Waternet is freeware, no money can be asked for it, you may place this game on any cdrom, dvd or whatever you like as long as you are only charging money for the distribution costs and not the game itself ! If you like this game please donate me a small amount of money even if it is just 5$ it will help me out. Found a bug have a problem ?